The harsh fact is that people do judge a book by its cover. 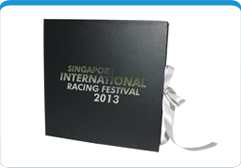 Moreover, a hard cover is indispensable when it comes to presentation, durability and design. With our expert team of designers and concept artists, we would help you create a cover that would capture the attention of your potential customers. Moreover, with our advanced printing technology, we would help you achieve an excellent finish with every cover printed. 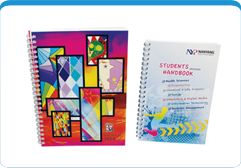 Print projects with soft cover requirements are usually those that are made to be handled with ease. Moreover, be it just a simple shape or fanciful words and designs, they come with special die-cut designs. This creates an impactful impression in the mind of the consumers. We pride ourselves as a one-stop soft cover print specialist with full capabilities in customized design and print requirements. The process of stapling along the spine of multiple sheets of paper that has been folded in half is known as saddle stitching. This is the most common type of finishing for documents beyond a single folded sheet. It is seen on most booklets, pamphlets, and reports. As a general rule of thumb, this technique is unsuitable for documents comprising more than 76 pages of 80gsm stock. D-loop binding is not commonly seen in Singapore. However these kind of binding technique has its advantages in the sense that it prevents the warping of pages. Consult our team to find out which type of binding best meets your printing needs. Wire binding is one of the most popular commercial book-binding methods. Documents bounded with wire binding opens completely flat on the desk and allows for 360 degrees rotation of each individual page. Double loop wire binding is achieved with our heavy duty modular interchangeable die punch along with an electric wire closing machine. 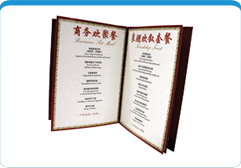 Consult our print specialist today for more information on wire binding and your custom requirements. 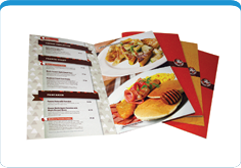 We promise to deliver quality when printing restaurant menus. 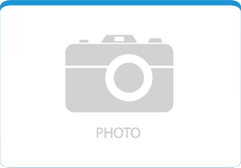 We ensure that images are of high resolution such that customers would start to drool once they look at the images of food. Moreover, we would ensure the paper used is water resistant in nature to ensure that it would be long lasting and easy to clean as well. A calendar makes an excellent choice as a corporate gift. 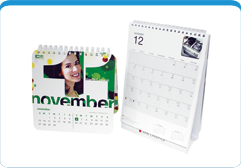 We would help to customise and print calendars that are functional, durable and also vibrant. We possess the ability to produce high quality calendars that are attuned to your company’s brand and image. A notebook serves the writing needs of the general population while promoting a company's image at the same time. Where quality is concerned, nothing is compromised. Our notebooks come in a variety of customized concepts, from colour choice to design to finish, and is guaranteed to leave an impression on the end-user. You can also request for the printing of personalised concepts. An organiser is an under-rated piece of stationary. Whether it is to keep track of the week's schedule, or as a carry-about accessory, an organiser is definitely essential in the working world. Quality of the finished product is quintessential making our custom made organisers a popular choice to meet the marketing objectives of companies in both the private and public sector.